Imagine the Yankees or the Red Sox as World Series champions. Meh ... it's been done. 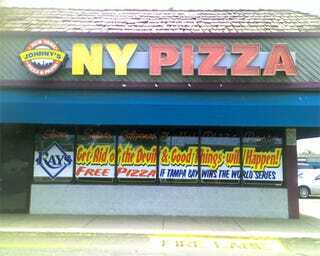 Now imagine the Rays with the trophy, and along with it, the promise of free pizza for everyone in the world. Yes, Lakewood, Colo., pizzeria owner John Keiley is at it again; promising free pizza to the masses if the Rays win the World Series. And considering his track record, that means it's probably gonna happen. Sounds crazy, especially in Colorado. "People come in and ask, why did you pick the Rays?" Keiley said Tuesday. But he has his reasons. And he might be on to something. A few weeks ago, he was impressed watching on ESPN as the Rays rallied to beat and sweep the Red Sox. He called a childhood buddy from New York (they were Mets fans), George Vricos, who now lives in Clearwater. The more he heard about the Rays, the more he liked. So he made his latest offer. "I'm rooting for the Rays," he said. "And if the Red Sox and Yankees don't get in the playoffs, that would be heaven."